A match will be held at Ash United Football Club on Sunday, August 28, in memory of Graham Tufnell, who sadly died from pancreatic cancer. The family of a former footballer and estate agent who died from pancreatic cancer, have organised a charity football match in his memory. Graham Tufnell, who set up Aldershot-based estate agents Tufnells, was diagnosed with pancreatic cancer last year and sadly died six months later, aged 46. His family and friends are now organising a match at Ash United Football Club, in Shawfield Road, on Sunday August 28 in aid of Pancreatic Cancer Action. Co-organiser of the day, Trish Ahmet, said: “Graham was an amazing family man and left behind his loving wife Michaela and two daughters, Charlotte and Jessica, and son Joshua. something in Graham’s memory and to honour him, as his passing has left a huge void in all our lives. “At the same time this is a good opportunity to raise lots of money for the Pancreatic Cancer Action charity. Having played for Ash Wanderers many years ago, Graham’s former team-mates, school friends and family are coming together to play in his memory. Kick-off will be at 3pm with a minute’s applause and balloon release scheduled to take place before. The match will be followed by a raffle, auction, barbecue and disco to celebrate Graham’s life. 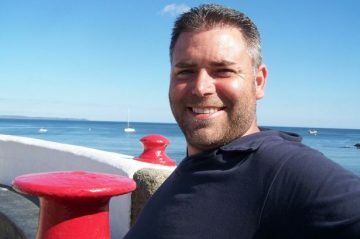 You can donate in Graham’s memory at www.justgiving.com/remember/273452/Graham-Tufnell.